Hello. I am an editor at The News & Observer. I would like to talk to the person who runs this Web site. Would you please give me a call? Thanks. Jane Ruffin. 829-4570. I cringe every time I look at that ugly "motel." The Oprah plea adds a surreal touch. The whole mess looks like something out of a J G Ballard novel. Why don't they reopen the rooftop swimming pool? It would be rad. I agree - you could relax in your lounge chair and gaze out on the miles of brick beach below. I wonder whatever will become of this property. Though total removal of the motel would make way for some more residential or office space in the city center, it could still function as a motel. Maybe update the facade with all tinted glass (sans 'Oprah')renovate the 1970s interior, re-open the pool...It would add more guest rooms and could be a pretty unique property. And unlike the Durham Centre tower, it has retail space beneath its parking deck. Thanks for your comment. It is interesting that some elements of this motel are what constitutes good urban design - as you point out, first floor retail, built to the street, integrated parking behind the active facade. In-and-of-itself, I think the window-wall design could have some good retro value (just updating the colors/painting the frames would help.) To me the worst design element of this building is the overhang of the upper floors - makes it look fat and top-heavy. As another poster pointed out, the rooftop pool would be fun. Although this hotel is rather dated in appearance, I think it is every definitive part of Durham history. I would like to talk to Ronnie Sturdivant about his plans for this site. Please give me a call. L.Terry at 919-824-1326. Thanks. I saw the article about this in today's Herald-Sun. I also saw the Bob Ashley quote at the end, that "we (Preservation Durham) would be very concerned about the loss of that building." Really, Bob? THIS is the building that PD wants to make their poster child? It's an eyesore, and whatever Perry wants to put in its place is bound to be an improvement. I hear you on this, and I would have fully agreed with you a few years ago (clearly I did, rereading what I wrote above); I've actually come around to like this building, personally. Although I'd rather have what was there before, I think it's rather cool urban design for its time. It's in ratty shape, but if its aluminum and window walls were shined up and the nasty curtains removed, I can picture some hip hanging out by the rooftop pool, overlooking the Bull. Ground floor retail, residential above, structured parking hiding behind are actually good design principles today. I'm not going to lie down in front of the bulldozer, but I think it's probably the kind of thing Durham's likely to demolish about 6 months before it becomes cool. Is it still a functioning Motel or is it apartments now? I have always wondered what the heck was up with that place. And whoever mentioned "surreal" in relation to the Oprah signage is right. Surreal and not very attractive. I believe the entire upstairs is vacant - definitely neither motel nor apartments. The first floor contains retail and offices. Every time I look at the Jack Tar, I think of the Hotel San Jose in Austin, which is "motor court" motel of a similar (but a little earlier) vintage, and has been renovated into one of the hippest places to stay in Austin. With that outdoor pool space, the retail below, and the downtown location (not to mention the extant parking), it is a great opportunjity for a savvy developer who understands how cool (and profitable) mid-century architeture can be. I really hope someone can 'educate' the new owners on the possibilities.. Cool cities that Durham would like to emulate are leveraging the new hip-ness of mid-century modern. I feel pretty confident that the Jack Tar could be added to the downtown National Register district as a contributing structure at this point, and be eligible for historic tax credits. Spiffed up, these structures can look very cool. The Bel-Air Motel in St. Louis is another good example. Are the 'Jack Tar' and the Oprah motel the same building ? I thought that the Jack Tar was a demolished taller hotel building located on The now-CCB Plaza ? I am pretty sure that people live in this building on the upper floors. I like to walk around late at night when I am down that way and taking the elevator up recently showed some notices posted for 'residents' that the electricity would be turned off for a few hours that week for some work being done. Just don't take the elevator down to the parking entry-level, at night for sure anyway, the glassed-in entry doors are locked and if you step out of the elevator and it closes behind you and you somehow can't recall the elevator or the power went out or whatever, you'd be trapped in there and have to break your way out through the glass walls. The top of that wacky sloped parking rooftop thing is a great 'hidden' people-watching spot at night. Thanks for such a wonderful resource and being a voice for good town planning. I grew up in Durham and was bored stiff with the aluminum covering of significant structures (Bull Durham Factory) and vertical blinds that resembled solar collectors. I am not a fan of mid-century, but processed a bit, this could be a funky-cool-retro location that I could really buy into. I am sure those who tore down Fairview, Waverly Honor, Pandora's Box, Union Station, and other "outdated" structures had the idea that no one would ever care for these places either; their style would never show favor in the future and there were better uses for the land. Same old story. It is the same story for the structure Jack Tar replaced. My grandfather worked night shift at the parking garage booth for a number of years, until his retirement somewhere around 1980. My great uncle (his brother-in-law) worked the day shift. I helped to harvest a lot of vegetables that my grandfather would sell while working night shift. He was from and lived in Granville County. During the summer months that was a second source of income for him. There is no telling how many pounds of tomatoes that he sold during the years that he worked there. That was his best seller. Story in the Herald Sun today is saying that a Colorado development firm has it under contract now, wants to renovate to "hip modern hotel"
I kind of love that NIS proclaims ignorance that people were living in the Jack Tar. 202-204 N. Corcoran and 206-210 Corcoran (the Hackney Block) took up about half the street frontage of Corcoran Street between Parrish and Chapel Hill Street. This view from the 1910s shows only the northern building. It is taken looking east, across Corcoran Street, and shows the detailed cornice and finials. 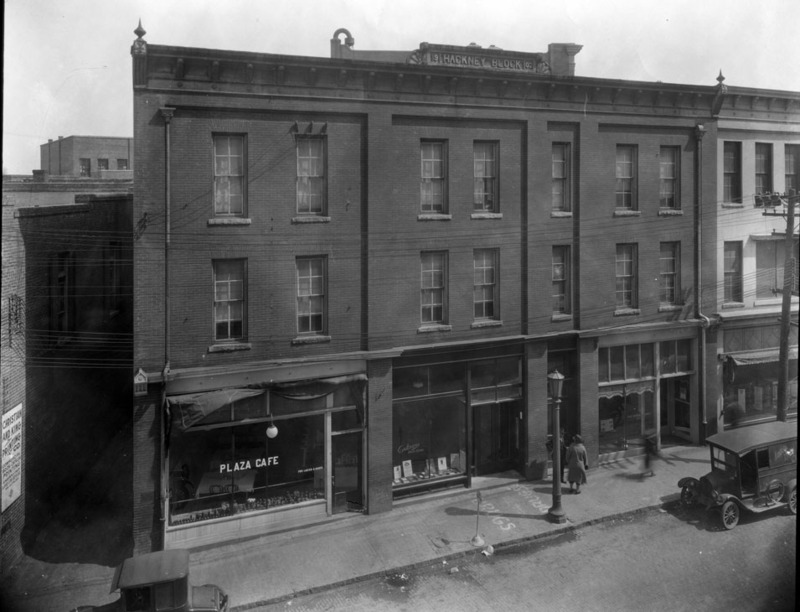 This picture shows a street-level view of the southern building, likely 1915-1925, looking east from Corcoran St. 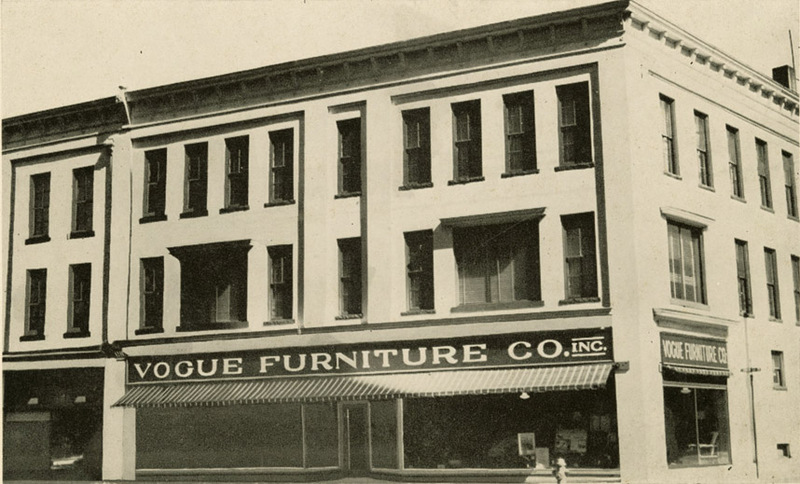 The building immediately to the east of the Hackney Block was the longtime home of Kimbrell's Furniture. 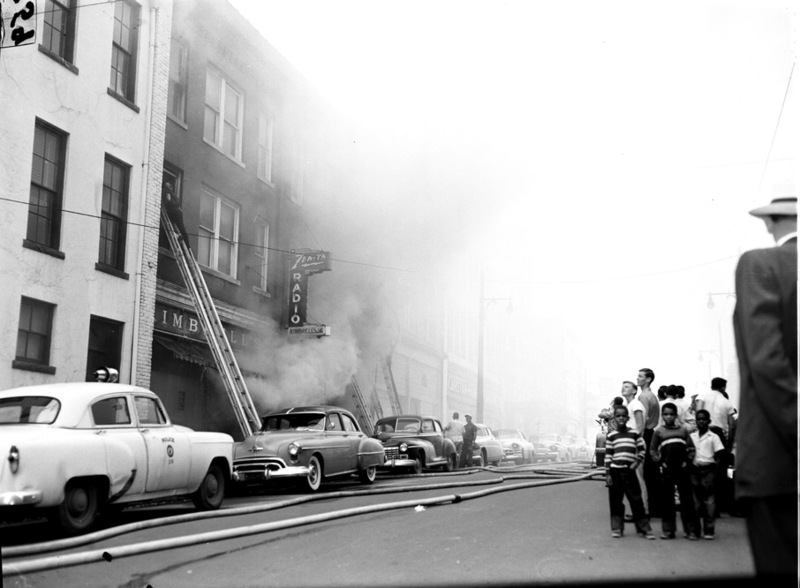 In September, 1955, this building burned. This view from late 1955, looking northeast, show the entire corner, including the repeating cornice line of the two buildings as they wrap around the corner, and the burned-out Kimbrell's behind. By 1956, Kimbrell's has been torn down and turned into a parking lot. A low aerial shot looking north on Corcoran St.
By the next view, from 1961, the eastern building is gone, and the Hackney Block is showing signs of neglect. By 1962, it and another building on W. Parrish St. are mostly demolished in preparation for construction of the Jack Tar Motel. By 1963, the first stage of the Washington Duke Motel is complete. Attempting to compete in the motel era, the proprietors of the Jack Tar (nee Washington Duke) Hotel sought to expand with motel space, including an integrated parking garage and swimming pool. Note in particular the skybridge that connects the new motel with the Washington Duke Hotel, directly west across Corcoran. It is also interesting to note that the motel was built in stages. You can see the remaining older commercial structure at the southeast corner of East Chapel Hill St. and Corcoran in this photo. Its days were numbered. By the late 1960s, the remaining older structures on the southeast corner of Corcoran and East Chapel Hill would be demolished as well, and the Jack Tar Motel would expand to take up the entire block face between Parrish and Chapel Hill Streets, and a large portion of the block bounded by those two streets, Corcoran, and Orange Street. The southeast corner of East Chapel Hill Street and Corcoran Street had consisted of three primary buildings. Chapel Hill Street was not the retail street that Main was, but had more service-oriented businesses. The two buildings with frontage on Chapel Hill Street were automobile service-oriented from the early 20th century. Southeast corner of Chapel Hill Street and Corcoran, ~1920. (Courtesy Durham County Library) Looking east/southeast from Corcoran Street. The Washington Duke Hotel was built in 1924. The automobile-oriented building on Chapel Hill Street (to the east of the corner building) likely provided some off-street parking for the hotel as well as gasoline. Looking west/southwest from Chapel Hill street. Washington Duke Hotel is in the background. 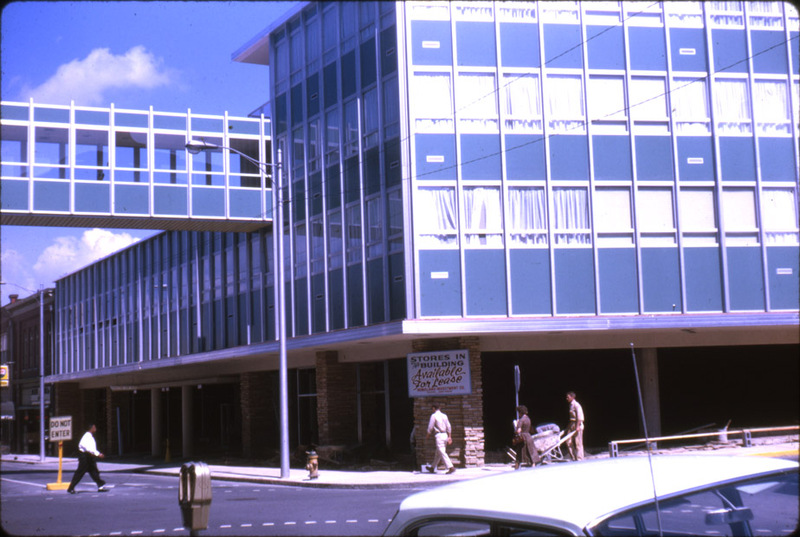 This building and the Hackney Block were torn down in the early 1960s to build the first stage of the Washington Duke Motel. This building was L-shaped, wrapping around the corner building and the other building facing Corcoran. The remaining buildings on the corner of Corcoran and Chapel Hill St, encased by the Washington Duke Motel. Interestingly, the auto-oriented building on the corner has been coverted back to retail. 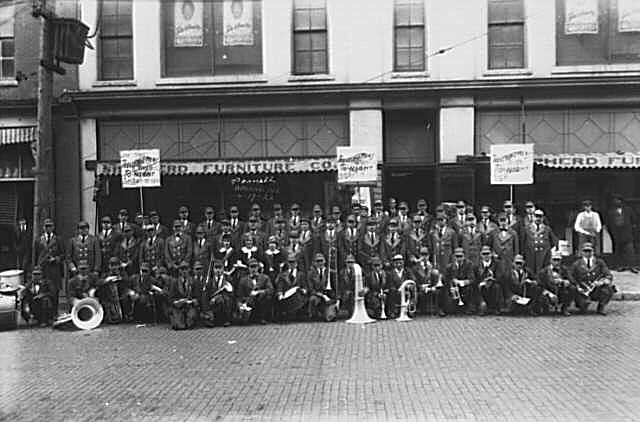 Ralph Rogers notes that it was the "Thomas Bookstore". These buildings would survive a few more years, but by 1966, that window-walled morsel of goodness known as the Washington Duke Motel just had to be expanded. This building is primarily Ronnie Sturdivant's homage to Oprah now. The best thing that I can say about it from a design perspective is that it has first floor retail (Blue Coffee, TJ Phat Wear), which is how we are trying to build parking garages now. The rest of the building is just an eyesore - not just because it's modern, but because of the top-heavy form, the cut-out on the main facade, the blank wall on Chapel Hill Street, etc. Building from the corner of Corcoran and Chapel Hill Street. Love the juxtaposition of the new traditional streetlamps with the window-walls. From Chapel Hill Street, looking west-southwest. A small tidbit I've noticed before - look at the alley on the east side of the building. The original east wall of the "Auto Gas Storage" building is still part of the Oprah structure. I don't know if it functioned as a motel after the Washington Duke/Durham Hotel/Jack Tar Hotel went out of business, in the mid 1970s. As of 2006, it is owned by Ronnie Sturdivant, who also owns the empty former Holiday Inn on Chapel Hill St (Urban Merchant Center) and really seems to want Oprah. (It has become known as "The Oprah Building" in common Durham parlance. Since then, Ronnie Sturdivant was murdered, and his wife controls the building. Roger Perry, developer of Meadowmont and Woodcroft has optioned the property, which doesn't mean much, despite the excited frothing of some folks. He's interested enough to do some serious due diligence - that's it. I empathize with a general hunger for development to continue downtown, but given that there's vacant land just to the south of this that's undeveloped, and plenty of other vacant land around, I don't really see that taking this out is prudent or necessary. I think it's a long shot to move forward - if it's all multifamily, it could get financed right now, but it's a constrained site with limited options for parking if you want to maximize your apt. units. If it isn't, well, there's a lot of other planned new construction downtown that hasn't come out of the ground - not because developers aren't capable, but because the financing and tenants aren't there for it to make economic sense while we're still Recessing. I'm not going to lie down in front of the bulldozer, but I think this is probably the kind of thing Durham's likely to demolish about 6 months before it becomes extremely cool. And the likeliest outcome is that this "eyesore" becomes yet another empty swath of dirt, brimming with development 'potential', but no developers. Somewhat shockingly, there is a move afoot to renovate the Jack Tar Motel. Austin Lawrence Partners purchased the property from Ronnie Sturdivant's heirs, primarily to provide additional parking for Pickle II: Downtown Boogie that they are building next door on the old Geer Building site. These are photos of the inside, exterior and parking garage at the Jack Tar motel, taken in July 2014. Austin Lawrence Partners purchased the building from the Sturdivants for $5 million; the developer plans to restore it to a boutique hotel with rooftop pool, bar and lounge. It is scheduled to open in 2016. You can read the INDY Week story about the plans here.